This Cheetah animal print will have you skippin’ merrily along with its perfect blend of cute and sassy! 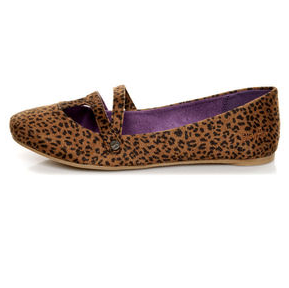 The Black and Rust Baby Cheetah Print Ballet Flats have a round toe vamp, with a mini T-strap detail that rocks an additional, slanted strap with logo rivets on the sides, all in soft, leopard print microfiber. Embroidered logo at heel. 1/4″ rubber heel. Cushioned insole. Non-skid, felted rubber sole. Available in whole and half sizes. Fit is true to size (round down if you’re between sizes). Measurements are for a size 6. Man made materials. Imported.